A small version of our award winning chain oil! Green Oil On Tour was created because cyclists wanted a smaller version of the Green Oil Wet Chain Lube. The idea was tested with an old 'King of Saves' shaving oil bottle filled with Green Oil, and the concept worked. 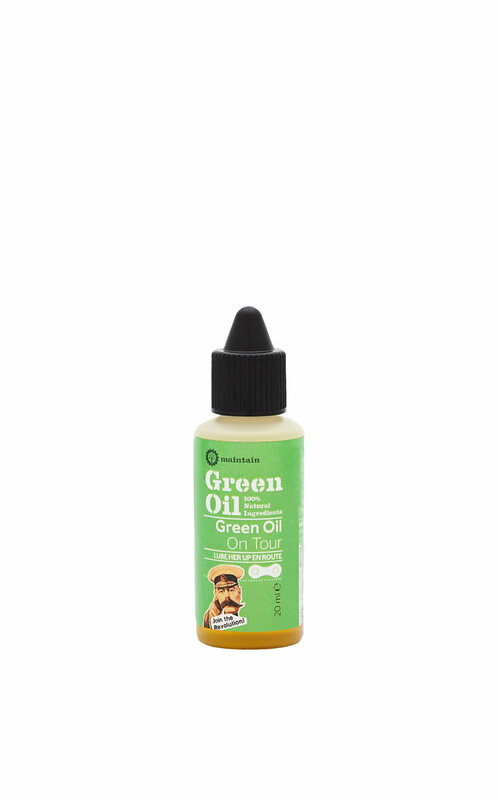 The On Tour can be refilled, by removing the dropper, and topping it up from your Green Oil 100ml bottle. The On Tour bottle is virtually leak proof. Its about the size of your thumb. It has a beautiful cap and dropper for easy application. A chain can be over 99% efficient. Friction occurs between the chain links and lubricating the chain reduces this - increasing efficiently. Your bike chain is exposed to the elements: water + steel = rust. Rust and wear due to friction also reduces the life of your bike chain. Green Oil chain lube reduces both, extending the life of your chain, and reducing friction, for a smoother ride. 1. Ensure the your bike is secure. 2. Work out how many times you need to spin the cranks for one chain circulation - Slowly turn the cranks backwards, watching a single chain link. 3. Apply your Green Oil On Tour bottle to the top part of the bottom half of the chain as illustrated in the diagram below. Apply to one length of the chain. Apply to the 'rollers', the cylinders on the chain. 4. Carefully spin the cranks a few times. Ideally, wipe off excess with a rag for a super clean chain. 5. Continue your tour, ride into the sunset! How is the Green Oil On Tour green? We don't use palm oil - all our ingredients are sustainably sourced. We use plant based ingredients, natural molecules with similar long chain molecules found in petrochemicals. The mixture used is sticky enough to stay on the chain, but not so sticky excess dirt sticks to it. The Green Oil formula has won numerous awards for performance. It's green, and it works! Re-fill, or recycle. Here are the recycling codes.